Dakota is a great trail companion. She stays by your side, she knows her boundaries, and she understands her place in the family. Like us, she has her own special needs out on the trail, and it is important to make sure she is comfortable when we are hiking and backpacking. It is important to note that everything we pack for Dakota is used. No sense in bringing what she will not need. Excess weight, like it is on our backs, will slow down a dog. Dakota’s pack typically ranges from 10 lbs to 15 lbs depending on the hike. Below is a list of things we bring with us on our trips (including a leash) with Dakota. 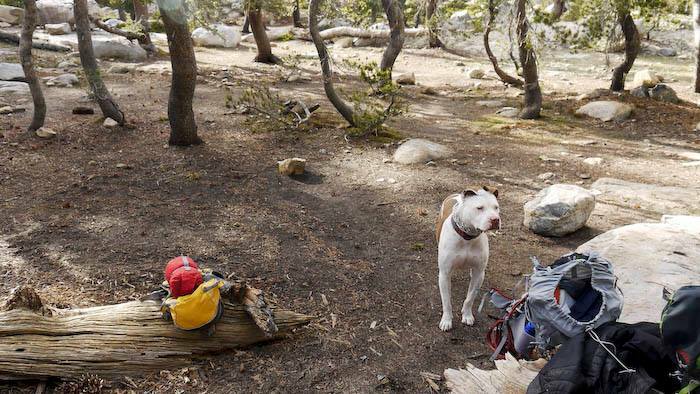 While not absolutely necessary, a dog pack will help you out on the trail. Dakota packs quite a bit of weight with her. I have met hikers that carry all of their dogs gear and I can’t imagine adding an extra 15 pounds of weight on my back. 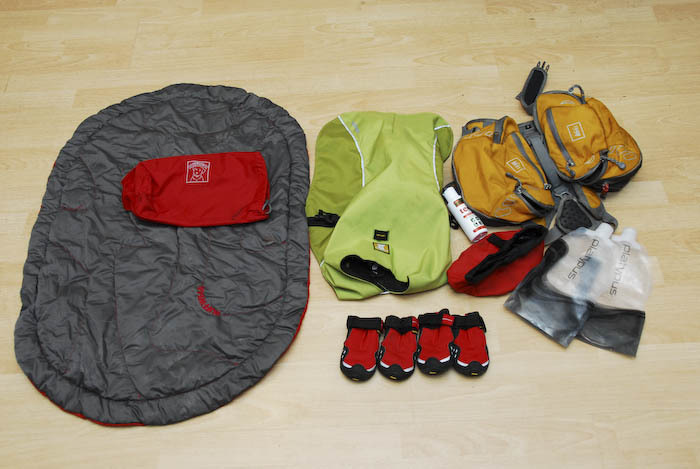 A comfortable, well fitted dog pack will make hiking enjoyable. It also slows your dog down, making your dog easier to control (You aren’t as fast with 30 lbs on your back either right?). A general rule of thumb is that your dog should be capable of carrying up to a third of their body weight. BUT – we like staying conservative and stick with about 20 – 25 percent of Dakota’s body weight. Less weight on their back translates to less weight on their paws. Dakota carries two Platypus Soft Bottle at 1 liter each (2 liters total, for about six pounds of water). We prefer the soft sided bottles so we can squeeze more into Dakota’s pack. We separate the bottles and put one in each saddle bag, distributing the weight evenly. Keep in mind, water sources in the back country are not always clean. Some water is safe to drink, while others will upset your dogs stomach. Note: A good alternative to the Platypus bottles are the soft sided water bottles you can find at many stores. Daiso Japanese Markets sell inexpensive $1 soft sided bottles. A simple bowl or collapsible dog bowl is a light and easy way to serve water and food. We use the same bowl for both, interchanging between water and food during feeding time. We pack enough food for two meals per day. Dakota eats one cup per meal on a normal day. In the back country, your dog will need more food, general rule is adding 50% to 100% more food depending on your dog. Use that as your basis to pack food. All dogs need treats, especially after a long day of hiking. Bully sticks (smaller than raw hides), meat chews, and milk bones are treats we carry for Dakota. We give her treats during the hike to supplement her meals. We pack all of Dakota’s food in zip lock bags, One bag per day (approx 3 cups per bag). We learned early on that Dakota does not like sleeping on the bare ground. She constantly wants to jump in our sleeping bag. Some dogs, particularly long haired breads are okay in back country weather. Because Dakota is a short hair breed, she is intolerant of cold weather. We picked up a Ruffwear Highlands Bed for her on sale, which fits nicely to her pack. Cute factor increases 100%. Similar with the sleeping pad, we keep a dog jacket on hand for Dakota. A tough high visibility jacket that is water proof on the outside and warm on the inside helps your dog retain heat at dusk and throughout the night. Dakota rocks her Ruffwear K-9 Overcoat because of the durable abrasion resistent exterior. Some dogs that have not developed callouses should use dog boots to protect their feet. You need to break in the boots before taking them out on the trail. We use Ruffwear Grip Trex for Dakota. Not necessarily something you should pack, but something that should be a regular item with your dogs monthly medication. Mosquitoes are everywhere, and heartworm is contracted by mosquito bites. Making sure your dog has heartworm medication will save you on costly medical bills later. A given that should be kept in your pack, with our without your dog. The athletic tape will help with any open wound injuries your dog may encounter. Athletic tape will help with injured paws as well – a good option for those that do not carry boots. If you are backpacking in areas with a lot of poison oak, carry some Tecnu or poison oak removing soap. You will thank yourself when your dog jumps through a bush full of poison oak. Sharing a tent with a poison oak covered dog – no bueno. 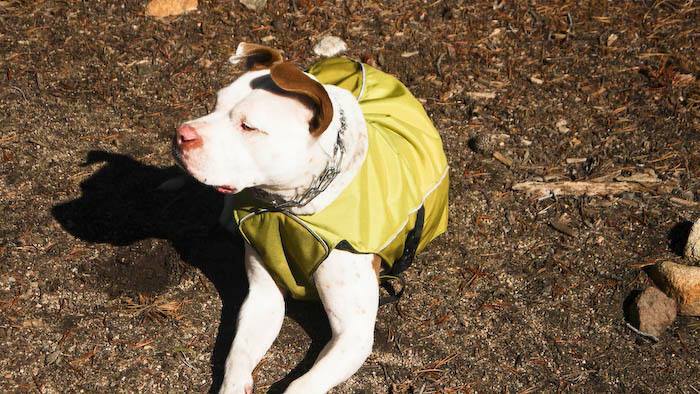 While there are plenty of other gear you should or can bring with you on a trip for your pup, we recommend at least considering bringing the 10 listed in this post. Remember, a comfortable, happy, and prepared dog is a dog that will make it home at the end of the trip. The dog boots made this post a must read. Thanks! It’s awesome to see Dakota so happy out on the trail!